The old saying goes, “Be careful what you wish for.” You might actually get what you wish for, and you might find out it’s not as good as what you already have. What is even more unfortunate is when someone else wishes something for you, even pushes for these changes, but you’re actually quite happy with the way things are. This is happening right now in the life of a Western Pennsylvania icon. Punxsutawney Phil is the most famous groundhog in the United States, and probably the entire planet. He has an entire day devoted to him, local dignitaries handle him with kid gloves and an entire town springs to life in the middle of the cold winter. Hollywood even made a movie about his special day! The media arrives at this small Pennsylvania town each February 2 just to perhaps catch a glimpse of Phil to report whether the critter has seen his shadow. Legend has it that if he does, he will be frightened by it and scamper back into his hole, dooming us to 6 more weeks of winter. If he does not see his shadow, we can look forward to an early Spring. This fuzzy little groundhog has it good. People love him even if he does see his shadow. He has air conditioning in the summer and a heated pen in the winter. He lives year round in the town library along with three other little buddies in a well-kept pen. His food is brought to him; he does not have to risk the wrath of Farmer Brown or any other gardener armed with BB guns. Unfortunately, someone is trying to ruin Phil’s gig. Gemma Vaughan, an animals in entertainment specialist for PETA, wrote a letter to Phil’s handlers urging them to use a robotic rodent to replace Phil. She believes it to be “cruel” to have these shy creatures on display, adding that they get stressed when being handled by humans or facing large crowds. I wonder how she knows so much about what these critters really want? Seems to me a pretty nice arrangement for Phil. One morning of “work” nets him some comfortable digs for the rest of the year, and it doesn’t even matter if anyone likes the results of his efforts. He and his buddies are treated like celebrities, and don’t have to risk their lives foraging for food. I think even a shy critter could warm up to the humans that take care of them like that. And I think Phil would tell PETA to stay out of his business if he could. Today was the last day of our county fair, and like most years, it was the day of the horse-pull event. For the same reason, I suppose, that he plans an entire week of vacation around the televised Tour de France, Big Daddy looks forward to the yearly horse-pull event. It obviously doesn’t take a whole heck of a lot to get the old guy excited, which is why I’m not too worried about the extra weight around my middle. I usually tag along with him to see the displays, ooh and aah over the animals, and get a yummy greasy gyro with some fresh squeezed lemonade. I have to admit, I’ve even grown to enjoy the horse-pull. The animals are beautiful and majestic, working as a team to pull some big-time weight. They called for an all-day rain and we were worried the event would be canceled. It did rain right after the light-weight horses finished, but it was a quick downpour and ended up to be a beautiful sunny day. We did have a long wait, however, while they scraped the mud and resurfaced the arena for the heavy-weight horses. As we were leaving the fairgrounds, I got a glimpse of what I might look like if I ate like this every day. I didn’t bother to ask for the chocolate bacon recipe. If you love animals like I do, you might want to check out some of these cute pics on my Facebook page. There was a phrase that Big Daddy(my hubby) and I used to use, back when we were younger, referring to older women that wandered around aimlessly in grocery stores, drove 30 mph in the left passing lane without getting over, and just generally meandered glassy-eyed through life. “Middle-aged crazy,” we’d chuckle, shaking our heads. Now I’m not laughing anymore because not only am I middle-aged, but I may be stepping into the realm of the Middle-Aged Crazies. Example One: I really thought that was a picture of my dog Sky that I posted yesterday. It was, after all, on our computer. 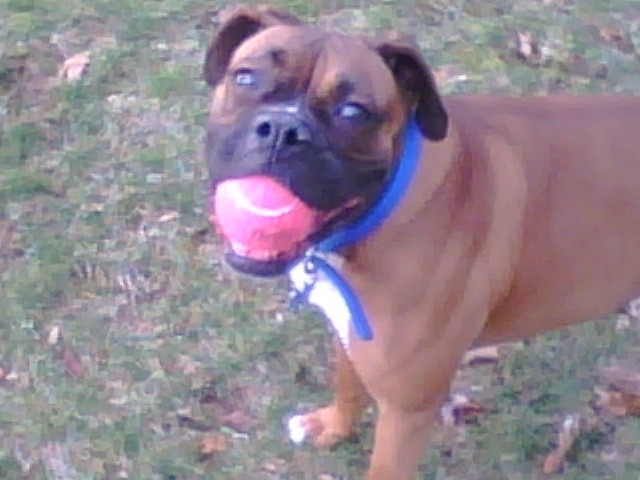 It is a boxer with very similar coloring. In fact, even though I couldn’t recall the floor it was standing on and I didn’t think she ever had a purple collar, the fog just didn’t lift quite enough for me to grasp the reality until I picked up Youngest Son from college. He asked me why I posted some random dog on my blog when he had sent me so many good pictures of Sky. Wow. Then Thunderbolt Number Two–and this one is disturbing. I never realized that little lab rats, after performing their duties for science, were then euthanized. This new knowledge just upset me immensely. Not that I’m overly fond of rodents. I wouldn’t want to find a rat in my house. I don’t know where I thought they would go. I guess I just never thought about it which makes me feel really dumb considering my age and all. So, about that tax return I’ve been working on. I think I’ll check it over several times before I send it off into cyberspace. I’m feeling kinda dumb today. I know. I just started back to work on Monday and here I am with a day off already. It’s still early for our tax clients and the work usually is still trickling in at this point. In a couple of weeks, we’ll be buried in it. And the timing works out perfectly for me to be off today. I had an envelope to send to Soldier son, so I got up early and went to the Post Office. When I came home, our boxer, Sky, was all excited because I had my coat on–which she immediately interprets as TIME TO PLAY! So, even though it was snowing out, I took her out to play. Boxers are full of energy. If you don’t tire them out and keep them busy, it’s like torture for them. And torture for us. If you get too busy to tire her out, she randomly will growl at you, usually when you’re right in the middle of something. And then you’re not sure if she needs to relieve herself, lost a ball under the furniture, or just wants to go outside to play. So you stop what you’re doing–and find out she doesn’t have to peepee and didn’t lose a toy. So the best thing is just to get her good and tired. Like they say, a tired dog is a good dog. And she needed some attention. I think she was moping around the past few days while I was at work and no one was home with her. I’d come home at lunch to take her out and she wouldn’t pee. But that was probably because her food and water dish were left untouched. She wouldn’t eat until we got home! She must have thought we were abandoning her. One of her toys, a great big yellow felt jack, was dropped in front of our bedroom door like she had been tracking us down to play with her. It was kinda sad. Later today, Youngest Son is actually coming home for the weekend. We suspect he was trying to “punish” us the past couple weeks for not letting him take the truck back to school with him last time he was home. He not only didn’t come home, but he was rather stingy with the text messages. But, maybe he was just busy getting A’s. In the meantime, before I have to pick Youngest Son up, I will be glued to this computer trying to finish up our tax return. Wish me luck!